Welcome to MK-Ultra - Would You Like to Be Fried With That? During the severe torture and psychic directed energy assignation attempts, the victim is encouraged to commit acts of violence against anybody the attackers can make the victim believe is doing it to them, usually neighbors, ex-lovers, or ex-bosses. The directed energy weapons test victim will easily be discredited as a violent loony in the news. The police and FBI will not ask any further questions about the incident either because of trained ignorance or orders. If the victim survives this phase which can last several months or years, a hypnotic pulsing is used to subdue the victims so that they don't seek revenge on military installations or the CIA for trying to kill them and for torturing them. An apathy signal and permanent hypnotism is used to keep the victim subdued until their death in a soulless, mind controlled emptiness trapped in a secret prison camp in their own brain. Have I congratulated you yet for living in the land of freedom? There are only a handful of scripts and methods the CIA shadow subintelligence agency use when practicing their trade and developing their methods. All the scripts rely on creating incredible anger through endless torture, frustration because no one will believe them or help them, and then redirecting the anger to a person, usually a neighbor, local authorities, FBI, President, political party, an x-boss, or x-lover, or some variation. Redirecting the anger and frustration while pushing them to the brink of violence is the strategy in creating a mind controlled assassin or Manchurian candidate. There are only a couple variations using obsession and love as the delusional driving method to motivate an assassin. Two well known love driven assassins were John Lennon's and President Regan's shooters. I have only met one Colonel from the Air Force that had the delusional love affair mind control experiment done on him. It appears that there was no follow up yet to direct him to kill a specific target except maybe the famous singer who he was mind controlled into believing suddenly left him. He recognizes it now as a delusion so powerful that he divorced his real wife. He was flying Top Secret planes at the time it began. So I am sharing some very basic methods with other nations and this one for whomever will listen how to defuse these MKULTRA EEG heterodyned programmed assassins. Neural programming, psychic driving, depatterning, torture, skinner behaviorism, neural linguistic programming, hypnosis and many other techniques are used on these many government projects as they are called, or CIA/DoD psychotronic slaves. In order for there not to be an easy association between the violent outbreak and mind control experimentation, almost all projects must be classified as mentally ill first before triggering them. The news or ignorant local authorities will report a mentally ill person went wacko, for no reason. That way "the subject will be arrested and dispose of once the assassination has been completed by local authorities." Taken from CIA documents (see appendix). That document amongst hundreds of thousands of others in the last year have been reclassified by the CIA as secret and taken out of the Library of Congress. I am republishing some of these documents in the Appendix. It is truly sickening how this has all been covered up and will never make it into public school history books to warn the next generation to be more vigilant, maintain the standards of the constitution by selflessly putting time into political activism and educating themselves on the issues. Just watching the hypnotube will do nothing but program you with paid advertisements and government sanctioned information. The tortured victims are often stalked, neurons amplified with electromagnetics, and often they have been drugged with long term hallucinogens which make them paranoid or from their perspective, 'sensibly sensitive'. These Artichoke assassins or "domestic terrorists" in the making simply need non-government tortured people to acknowledge that it may be happening to them which will diminish their frustration level. They want to be believed, and to know that you will keep a watch out for unusual activity. You will do a little research to see if there is precedence for what they are going through. If you suspect your neighbor to be one of these victims, I thoroughly recommend that you take these steps to defuse the situation. The perpetrators or operators of these mind control assassination experiments almost always use the neighbors to gas light the increasing paranoia. Some neighbors may be undercover spooks and decoys while most are innocent. The torture which feels like you are being microwaved is timed with neighbors coming home from work and often doing home repairs with construction like equipment. Voices are thrown from the neighbors apartments using the ventriloquism methods I described elsewhere in this book. You won't believe how many victims are 100% convinced their neighbors or cars parked outside their homes contain this very sophisticated weapon and is being used locally. They file lawsuits against their neighbors or worse. It is all about the timing of the torture and voices. Naturally, over time the victim will see a complete correlation of neighbor movements and noise correlated with their pain and suffering. With each reported case to the local authorities, more desensitized they become to it and more enforced is their policy to call these victims crazy. You can be a little hard on the local authorities for being uneducated in physics and history, but you can't blame them given their limited mental abilities for not being able to solve these kind of cases with such limited resources and access to federal level information. Plus, it is not their role to act as a sort of federal level internal affairs looking for high treason in the military and executive branches. They simple don't have the authority to investigate at this level. In fact, the reason that the 3 prong government failed is because our founding fathers couldn't foresee the sophistication of the corruption and technology that would facilitate it. If they had foreseen it, they would have create a forth branch of government whose soul existence was to act as internal affairs police to the other three with unlimited security clearance, their own military, and reports directly to the public. Shame Game - Try to make victim believe they brought it on themselves. Extreme Brutality - One method to make victims testimonies unbelievable is to make the torture and experimentation so extreme in intensity, carelessness, and duration as to make anyone who speaks of it sound delusional. "There is no way the American government would allow torture and practice assassinations on random citizens. They would be caught at some point and exposed," is the general thought process of the average American who doesn't know CIA/DoD's history. Yea, all which it inherit, shall dissolve, And, like this insubstantial pageant faded, Leave not a rack behind. We are such stuff As dreams are made on; and our little life Is rounded with a sleep. These weapons tests by treasonous power addicts in the conspiracy on people for the last 30 years have inspired many movies besides "The Matrix". I have seen many movies where television white noise communicates voices or images. "Poltergeist", and "White Noise" are movies which describe the effects of Stocklin's patent on voice transmission directly to the audio cortex. It is simply an amplification of the perceived sounds in the frequencies of the audio transmission. So white noise would be ideal for stimulating the neural frequency circuits that a voice transmission via induced neuron amplification would need. It would be perceived by the target as the voice coming from the sound source. A similar effect for visual imagery in white noise can be achieved with stimulating the visual cortex. The CIA's programs and the TSS division who develops their drugs and technologies have not changed since the 1950's except the remote hypnotic inter-cerebral control (subsumed under TAMI) has improved dramatically. It also appears that they may be rerunning all the MKULTRA and ARTICHOKE remote assassination exercises. I found documents from the CIA in the book "Secret Weapons" that exactly described everything I was put through step by step. Nothing differed. I know of many cases the FBI did not solve correctly and these "practice" assassinations landed these mind control victims in prison for life or they got the death sentence. Discredited and disposed of permanently. Who is the greater threat, the CIA or the Russians? The CIA has killed and damaged our way of life far greater than any Russian attempt. Proud to be American, aren't you? These programmed assignations get written off in the news as some crazy went on a killing spree. Most American's, politicians, and FBI are ignorant that these unethical, immoral, and repetitive experiments in ever growing numbers continue to this day nearly unchanged since the 1950's. An interesting note about the movie "The Matrix" is that Neo, played by Keanu Reeves, lived in room 101. Room 101 was where people were taken to be reprogrammed and tortured by their worst fears by the big brother society of George Orwell's "1984". You suffer in your own private purgatory, a personalized hell. Sound familiar? 1 - See the appendix for a reprint of CIA documents describing their bag of tricks. 2 - Nicholas M. Horrock, The New York Times, February 9, 1978. The cataloguing of brain wave variations and testing of EEG cloning/heterodyning have been going on for a long time. With each brain variance analyzed and catalogued in the database, the mind control weapon becoming more effective on a larger part of the population and more difficult to stop. It appears to many, that they are mopping up the outliers now. Assimilations into the brain profile database has picked up pace since 1996. Imagine that you were abducted and now an experimental human animal, property of the CIA/DoD. They place you on a table strapped down with your skull cut open and your brain exposed. They probe around with an electric probe to see what memories and functions they can stimulate. This goes on for months or years. You now have a sense what they are doing to thousands of people wirelessly. Is this allegation not important enough to sponsor an independent investigation, to commit a small amount of scientific expertise and monetary resources to nullify the population's fears that it could be true? Not a dime or person will be allocated to this. Are you frightened that America is not what it used to be, yet? There have been endless programs discovered by the freedom of information act that show how the CIA is developing hypnosis as a weapon. RHIC (remote hypnosis intracerebral control) is a continued program and part of the weapons effects program. Hypnosis is mainly thought of as a way to cure bad habits or uncover repressed memories. It can be used very powerfully in reverse to repress memories, create false memories, and program assassins or self destructive behavior. Ego - Sycophantry is the manipulation method. The need to be valued is what we all have. The biggest obstacle to objective thinking is Ego. It can be a driver to better ourselves, but the ego needs to be fed. It is a type of addiction. The larger part of one's drivers it becomes, more protection measures are created. It can be a source of great pleasure or great pain. It opens one up to being manipulated. Hope Delusions - One will always prefer the pleasurable belief between two seemingly equally valid models of reality. Hope gives us meaning and direction. Most people hold many irrational beliefs because they feel good. It begins in childhood with beliefs in Santa Clause and the tooth fairy, and continues in more complex forms into adulthood. Fear driven vs. pleasure driven people. There is an overall classification that people can be divided into those whose behaviors tend to revolve around worry, fear, and focus on avoidance of the fearful events. Then there are those that are bold, fearless, and whose behaviors tend to be seeking pleasures and adventures often appearing reckless in nature to the former types. Value - Creating the perception of value. Scarcity, desirability by others. We tend to value objects or even significant others at an extreme, by how desirable they are to others. Diamonds are a good example of this effect. A somewhat rare carbon formation that has very few practical applications, but because others value it, we do too. If suddenly everyone decided it was just a rock, the value of diamonds would fall to near zero instantly. Maslo's hierarchy of needs is another psychological model of motivators which includes some of the more primitive base drivers. Advertising and sales use all the above psychological control mechanisms to manipulate people's desires. This is an accepted form of mind control because one should be able to resist undue persuasion at ones own detriment through rational thinking. The same techniques are utilized for political campaigning. Carefully constructed images of ideal leaders are plotted. Acting has proven to be the most important skill in our leaders ironically since we have very little true knowledge of their competency or core values. Using a modified brain printing technique, EEG cloning can capture the moment of a guilty response feeling and continuously replay those brain signals to try and stimulate the memories surrounding the associated response. This is often more useful that the original brain printing method of simply identifying the guilty emotional response in order to infer truth. That system can be given false positives by pressing on the sternum by either of the EEG heterodyned participants because the feature set for classification must include a similar sensory signal. So the mind probe can be used in reverse to defeat polygraph and brain printing truth technologies used in the Justice system and in Top Secret clearance background checks in this country or abroad. Generally, they stay away from overt perceived auditory harassment of famous people but do not shy away from using the less obvious effects. It has been told to me from several sources that Michael Dukakis was targeted during his campaign for presidency. Also, the Russian Chess Master who played IBM's Big Blue computer complained about microwave confusion rays being directed at him. His society (Russia) is much more open about the discussion of neurological weapons. It is not a far stretch to see if political manipulation is being used by CIA/DoD who might have had an interest in assassinating JFK using a traditional mind controlled patsy. "The high office of President has been used to foment a plot to destroy American's freedom and before I leave office I must inform the citizen of his plight." at Columbia University, 10 days before his assassination. The crimes by the CIA and DoD have been difficult to prove without any government help in equipment procurement and scientific expertise. There are thousands of people willing to testify. However many of the victims have been successfully confused by the scripts and testing, and many others have been discredited by horrific tactics. There are still many like myself that have remained untouched by their attempts. Now you need a weapon and a motive for a case. The weapon is top secret and cleverly marketed as the continental missile and over the horizon radar defense system. It is difficult to turn them off to prove where the signal is coming from and submit the giant miles wide phased array antenna and participating satellites as evidence in court. The motive is complex since it operates at many levels. This complexity in both the science of the weapon and the diabolical motives are beyond the average person's intelligence and attention span to understand. In summary, the motive is human effects weapons testing and development for neurological weapons, but it goes much deeper than that. Even though torture and psychic assassinations are awful uses, the most disturbing to me and to democracy is that it is being used as a political manipulation tool in our own country and others. So even if you have the perpetrators, the weapon, and the motive, you would still need to find lawyers that wouldn't fear shadow government reprisals. On top of that, EEG heterodyning would be used to influence the judges and jury unless appropriate shielding and detection equipment were in place. It is difficult to see justice anytime soon. Torture is a tool used to achieve several goals during depatterning, programming, and interrogations. Especially with the group in the DoD that is experimenting with Manchurian creation. How do you create attack dogs or vicious animals? You mistreat them. Bigotry, chauvinism, and homophobia is alive and well in the unevolved ranks of government. My cyber hive mind group of torturers were composed of a woman, an Indian, a black man, and a gay white man according to them. These are the groups they were trying to direct my anger at and associate the torture. I've heard similar stories from the many interviews I have conducted. Their scripts also try to point the finger at China, Arabs, and Russia as the culprits of psychotronic torture and tyranny. When it becomes obvious which country is behind it, based on the literature and technology capabilities, they try to point the finger at the FBI, thereby possibly provoking an attack on them like in the Oklahoma Bomber case. Clearly missing is the finger pointing to the CIA who has continuously operated and funded these attacks on Americans and people worldwide in their quest for total mind control. This is fact if you care to educate yourself on the released federal documents. How will these experiments on creating bitter, angry dissidents be used? They can turn other countries citizens against their own government. The technique all hangs on making the torture victim believe that a particular group did it to them. So stage a kidnapping, torture the victim with accents from the patsy organization, set up a chance meeting with a CIA agent and they will be happy to help destroy those that the victim believes to be hind it. Creating spies and espionage agents out of people of their own kind is the goal of many of the CIA mind control technologies. Their experiments are reckless and careless as to the lives of the practice victims and society at large. They often try to make the victim believe that their neighbors, family, or ex-lover is behind their mental anguish somehow connected to the conspiracy of field agents that execute these programs. One man I interviewed was convinced that President Clinton was behind his psychotronic torture because they used voice transformation technology to project Clinton's voice utilizing the electronic warfare units capability of overpowering radio transmissions and faked a broadcast specifically to him. People who are unaware of these techniques used in warfare will be left confused and feeling insane, which is the ultimate goal of covering up the human mind control experimentation program. Another reason I surmise that the crack sales to LA black neighborhoods were not just for raising money for the Contra rebels like the papers have reported is because three people I interviewed who had a drug history said that the behavior modification mind control program started out by a technique called "drug driving". They described themselves as recreational drug users, and said that when the targeting began, they were given pain stimuli for certain drugs and suggestion to do other drugs with an induced spiral of depression and stress. This led them to cocaine or methamphetamine abuse they claim. This is what would be needed to improve amplification of the voice recognition neural pathways identified by dopamine saturation which facilitates the CIA synthetic telepathy to be used at low power intensities. It could also have the duel purpose of discrediting the human experiment. Here's a funny experiments conducted on me. My EEG brain partner bit into a lemon. The sour reflex cloned to me and they were able to capture the reflex to replay continuously. They always told me in advance what they were testing. I was left lecturing to my class with a lisp for 15 minutes. My voice changed and I sounded ridiculous. My students commented on it. If any of my former students are reading this book, they will remember that day. I chewed some gum to disrupt the signal. How embarrassing. You can image how useful this trick would be to use on a political candidate. While we are in this barbaric land of deception, I thought that I would point out an interesting but soon to be extinct species. Steven Gould taught me about catastrophic evolution and species that have produced cannibalistic mutations. If the cannibal gene is not removed from the genetic pool, the species becomes a leaf on the evolutionary tree. In human history, we have evolved this gene several times but have been able to contain it. Phylogenically 3 survival occurs because the dominant social structure recognizes the detrimental behavior and alters its mating probabilities or kills off the unsociable elements. Now, unlike other times in the history of life, a cannibalistic tribe has again emerged partially genetically influenced and partially culturally or mememically altered. The "shadow" government and their DoD/CIA weapons developers have evolved this detrimental mutation. They have been sacrificing and cannibalizing thousands of peaceful people in our civilization at random for many decades now. 3 - Definition: The evolutionary development and history of a species or higher taxonomic grouping of organisms. The historical development of a tribe or racial group. My research shows that it is growing in numbers as their budgets increase. The mentality is proliferating out of control. The militant minds have found a new way to replicate their sociopathic thinking and behavior. It must be stopped. But most unique to this cannibal strain, is that they have found a way to mimic the rest of society by thoroughly studying relationships, speech, and personality profiles and hiding behind their application of the psychology of persuasion. This makes it extremely difficult for the trusting population to see what they are without enormous amounts of research and time to validate their statements and evaluate their actions independent of mass media programming. Enough of my shamings for a moment. Let's relax to another stupid evil alien trick. "We are burning your heart. We are giving you a heart attack with directed focused energy to your heart." "The heart is on the left side of the chest, MKULTRA Moron. But that's good enough for government work!" It happened several times. These evil aliens aren't the brightest bulbs in the bunch. That is probably why they crash landed on Area 51. And this is why they practice on citizens. It fooled Saddam Hussein. Those CIA agents must have been pros and pressed on the left side. Good for them. This summons the image from the movie The Matrix where Neo restarts Trinity's heart in the matrix after a virtual bullet shot by the agent stops it. Truth is the summation of all self consistent perspectives. It is what our model of reality should asymptotically approach but can never reach. The practice that psychic soldiers and MKULTRA survivors undergo is to defeat guilt determining devices. I spent a week while under MKULTRA mind control experiments learning how to defeat brain printing and traditional polygraph techniques and the attackers practiced inducing false positives on these devices while I spoke. These tools are clearly useless with EEG heterodyning technologies and remote hypnosis. The Halloween theme and the satanic cult cover story never ended with my mind manipulation data collectors. 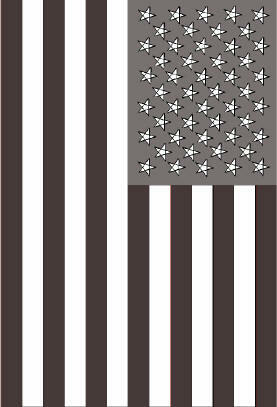 They even pointed out that the United States flag is Satanic and has an unlucky 13 prison stripes representing imprisonment of the 50 pentagrams on it. I suppose they were trying to break down my patriotism. However the damage is done and now I would now like to see the flag updated to something more cheerful. Here is the flag forced into my minds eye. Our DNA has a memory. If you model DNA as a biochemical computer, you can understand how memory is created in the evolutionary machine. Let's ask why do birds or sheep flock? At some point there must have been a survival advantage since the sole purpose of the genetic program is survival. Certainly flocking together makes it easier for a wolf to find a bountiful food source. It seems that due to limited food supply that flocking might even be a disadvantage. However, sexual reproduction is far more important for continuance than the disadvantages of grouping. This "socializing" gene which gives rise to the subjective experience of needing companionship is also the memory of the genetic strain to which this behavior was advantageous. Our primitive drives are composed of genetic memories and programs. The Nazi study of evolution through this model was called eugenics or directed evolution, implemented through genocide. Culturally, a similar phenomena can be observed. Culture, group behavior that is not genetically directed, evolves through memes and has memory that is stored within people's mind and passed on through story telling or chimpanzee like mimicry of learned cultural norms. The CIA is also conducting genocide of memes and belief systems or euphonized 4 as directed cultural evolution. 4 - Euphonized means to make pleasing sounding, i.e. propagandized. A form of deceptive marketing. There have been many books which study the MKULTRA torture techniques and mind control so I won't detail it here. But it is interesting to note that these techniques of mind control have existed long before the CIA. Suffering has been linked primitively to a creation of loyalty and comradeship. From medical doctors that suffering the right of passage of intense schooling, to boot camp and unnecessary military hardships, to religions that suffer on a day of denial or more severe tortures like with Christianity in the days of old with "beating the demons out" or self mutilation to suffer like Jesus did in vain. All these kinds of events cause a sense of belonging because of the pain and a sense of comradeship between all those that went through the same experience. Even a cultish, fun event like "Burning Man" 5 that takes place in the hash conditions of a desert each year, creates a sense of suffering together for a greater cause. This mentality may give rise to the "Stockholm" syndrome of hostages becoming sympathetic for their captors' cause. I was probably not mind controlled into CIA slavery from the torture because I despise anything that causes me pain. That's probably why I'm not married too. One foreseeable worry that the CIA/DoD has is repeating what happened to Rome with its moral cataclysm and Christianity. However the new religion is science. How will knowledge of the scientification of the human soul be accepted by the general religious masses? One such experiment I believe to see if science and religion can mix to form a new set of moral teachings and beliefs is Scientology. I believe that this is very much a CIA funded experiment. For my next book, I plan to infiltrate this perceived "cult" to find out more about its teachings and how they are so intertwined in the literature of CIA Mind Control experimentation. 5 A high end art festival that caters to fire displays and high tech lighting effects and describes itself as an experiment in community. A women from Harvard got her PhD in sociology by studying this culture. Another author was assassinated by the “blot clot” to the brain directed energy technique while attending the festival. The author, Jim Keith, of “The Octopus”. He describes the fascist takeover and mind control. http://en.wikipedia.org/wiki/Jim_Keith. 6 This is an invalidated statement. I have not been able to find the primary source to corroborate his statement.